Blackberry (Rubus fruticosus): growing, planting, caring. The shrub that produces blackberries - not to be confused with the tree fruit Morus nigra. A species of blackberry native to Europe, a perennial plant which typically bears biennial stems ("canes") from the root system, arching or trailing along the ground and bearing large palmately compound leaves with five or seven leaflets. The flowers are produced in late spring and early summer on short racemes on the tips of the flowering laterals - which have smaller leaves with three or five leaflets - that every can produces on its second year. Each flower is about 2–3 cm wide, with five white or pale pink petals. The blackberry tree is a shrub with erect stems up to 3m high. Its stems are biannual and die the second year, after fruiting. The strain emits new stems each year. These are armed with spiky prickles, the leaves are pinnate, those of the base have 5 to 7 toothed leaflets and the upper leaves are trifoliolate. The white flowers are gathered in groups of 5 to 10, the fruits are formed of a set of small drupes, adherent to the cone of the receptacle: they are easily detached at maturity... Well did we really had to describe you a blackberry? This adhesion is also the criterion distinguishing blackberry from raspberry. The blackberry is rather hardy, but nevertheless fears two extremes: the drought - the leaves turn yellow! - and the excess of water in clayey earth, which rot the bottom of the stems. It can also be sensitive to powdery mildew. Beware also of aphids attacks that are vectors of viruses such as mosaic. These are recognized by the deformations of leaves and stems! Mites such as yellow spiders swarm when hygrometry falls and the temperature rises. The mites also discolour and deform the leaves. Usual treatments - rather with manual handling than the use of chemicals! You can plant from October to March suckers in bare roots, and until May for plants bought in containers. The mulberry likes exposure in the sun, but not scorching. It can withstand the semi-shade, especially if it is leaning against a wall that will keep it warm. Not very demanding, the mulberry doesn't like heavy lands - of course, it will not balk in a rich soil. In a furrow 8-10 cm deep, bury the green shoots, ideally in a North-South oriented line. Space each plant by 1 m, and count 1.20 equally between the furrows. Warning: do not bury the collar of the plant, it would slow down its growth. You will need at least five mulberry trees for a regular family. Direct the growth of your blackberries before they become too large, partially to slow their development, which can turn out to be fairly quick, but also to insure optimum fruit production. If you have a full row of blackberries — lucky you ! — plant them in a line marked by small stakes, with wire connected to both sides of the stakes at a height between 70 - 150cm. Leave about 300cm of space between each plant. Your blackberries will grow and stay contained between the wires — nice and organized! Keep an eye on the stems and don't think twice about putting a wayward stalk back in line! If you only have one or two plants, you can use stakes to support the stems, but they need to be checked on regularly, even changing the stakes over the course of the season! Harvest blackberries in August. Be careful, sneaking between the rows of fruits can stain, so leave your beautiful white apron in the coat rack. And then, if you do not have any ideas, we recommend the yogurt and blackberry ice cream. Mulch in April to maintain humidity and to avoid repetitive, boring weeding. Water abundantly and cover with a thick layer of mulch. You can use dried grass clippings, wood chips, bark, straw or dead leaves. 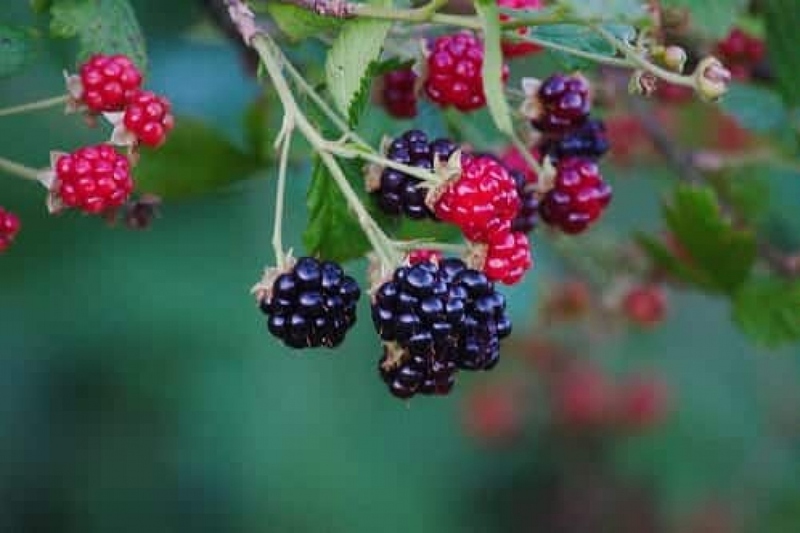 Blackberry trees do not require much watering, outside the first weeks of their installation, and of course if they are kept in tanks or in case of severe drought. The blackberry trees grow on the wood of the previous year, only once. So in autumn or winter, trim the branches that have already bloomed, and do not touch the young stems. Each year, amend the soil around your mulberry trees with a layer of compost, preferably before winter.